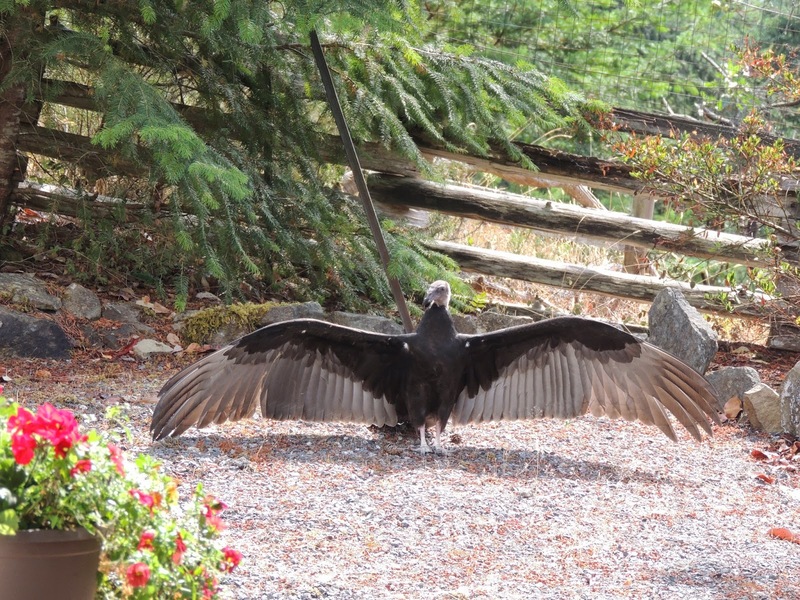 Vic the Vulture sunning in yard. I was looking out the front window, watching the bird activity in the front yard and eating my morning granola. Between the slats of the wooden blinds, I could just make out a female Purple Finch pulling seeds, one by one, from a dandelion puffball. She’d stretch her neck way up, grab a seed, then chomp, chomp, chomp, all the while scanning the area for predators. I had two thoughts: too bad she can’t just relax and eat without worrying about being grabbed up by a hungry hawk; and maybe I should give up on my war with the dandelions. Normally I try to pull the yellow heads off their stems before they go to seed, but seeing that finch feasting, with such gusto, on that “weed” made me think, did I want to create an inviting habitat for birds and bees - or not? For years I’ve been letting thistles grow tall and bushy behind the garage for the American goldfinch to harvest for the lining of their nests, and leaving buttercups for the bees and wild strawberries for the robins, and a massive brush pile at the back of the property for the birds to use as shelter. Why not leave dandelions too? Although still in production, another app, Which Bird, Which Plant (also under the LEARN tab) has the potential to be invaluable. 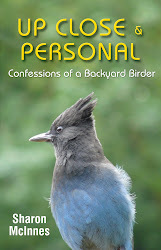 You click on a photo of a bird that lives in your area, narrow down the food types you’re interested in, and find ideas for native shrubs, grasses, and trees that you can plant to attract a diversity of birds. I learned, for example, that in addition to ants, Northern flickers like wild strawberries and the seeds of clover and grasses, and that Chestnut-backed Chickadees like pine seeds and the fruit of Western Thimbleberry. Western thimbleberry - just try and stop it once it gets started! One of my favourites, Downy woodpeckers eat wild strawberries, serviceberry, dogwood, and mountain ash. And you know that chickweed that’s impossible to eradicate? 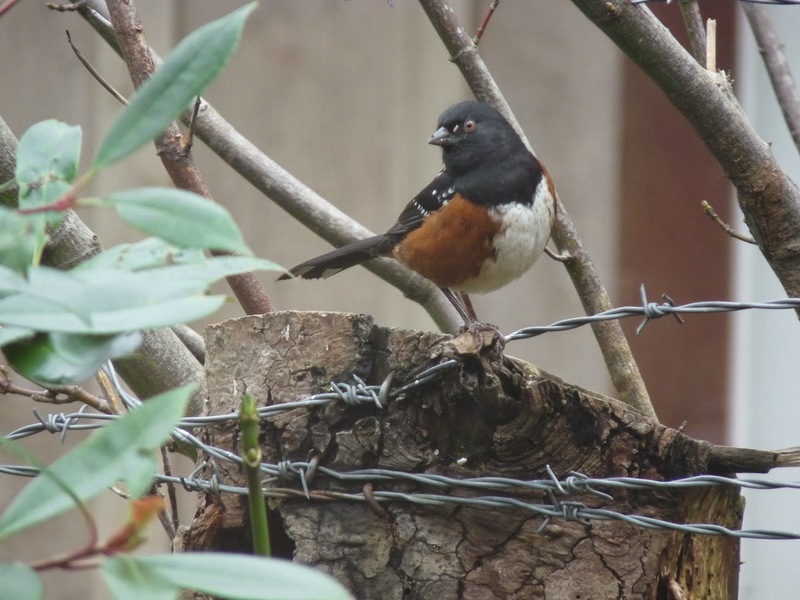 A favourite food of Spotted Towhees. Creating habitat that supports both resident and migrating birds is critical as climate change accelerates. 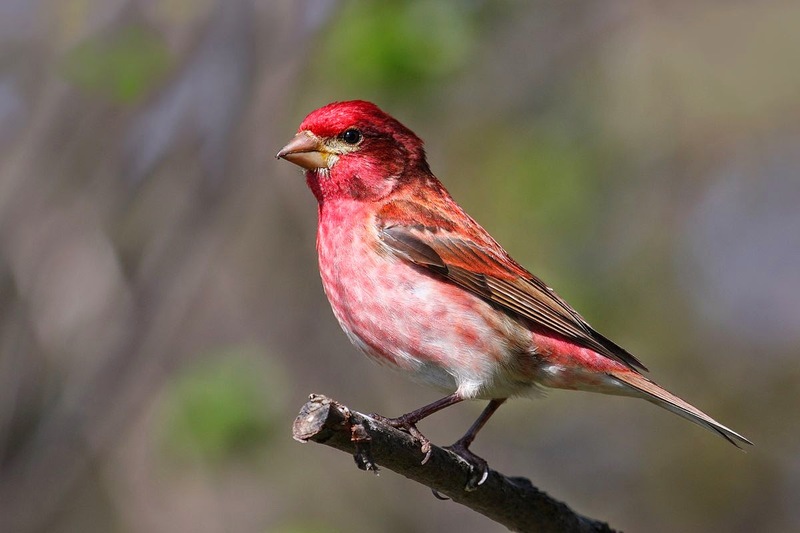 Many species are gradually moving northward, ‘following the climate’, but a recent study shows it can take up to 35 years for habitat to catch up with other changes caused by climate, probably because the specific vegetation birds rely on shifts so slowly. But we can help, especially since we live on the Pacific Flyway, by planting native plants whose flowering coincides with migration and by making fresh water and shelter available for even a few of the billion birds that travel from South America and Mexico to the Boreal Forest and back, every year, via the flyway. Oh, and we could (if we were so inclined) leave the dandelions alone.